I was going to write an update on “My 12 for 2012” but there is a matter more pressing to me. As I have no kitchen yet and too many lovely places to eat around The Square to succumb to the microwave, I have discovered that I have a few food annoyances. Firstly, a disclaimer: I understand the children in Africa are actually starving and that because of the recession many people find it hard to feed themselves let alone give to charity, so I encourage you to show your support through this feed the world game on FreeRice.com. The waitress asks you how you’d like your burger cooked. 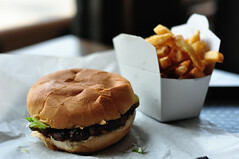 The only answer to that is ‘medium-rare’.When the meal actually arrives: the burger is well done. Now, it doesn’t make me angry but it disappoints me. Disappointing meals are sad. Please don’t create any expectations if you can’t deliver- ok? Thank you. I’m not that old that I usually start my sentences with: ” I remember when…” but I remember when you could just order a black coffee in a cafe. Perhaps it’s because of the pretentious coffee houses around The Square but when I ask for a black coffee I get blank looks from the barristas. The other day the guy even asked me: ” Do you mean an espresso?” No. If I wanted an espresso I would have told you. Just a black coffee. ” We have cappucinnos, lattes, Americanos, mochas.” Sigh. Ok I’d like an Americano please. “Would you like milk in that?” …. 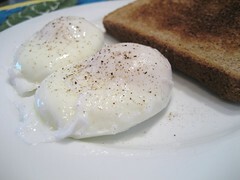 If your chef can’t poach eggs, don’t put them on the menu. I’m also happy with scrambled (actually if you’d ask me the million dollar Runaway Bride question, the answer would be ‘soft boiled’) in any case, like the burger: just don’t give me the option. Many a great start to my day happen with a croissant. It’s a little pastry of happiness. 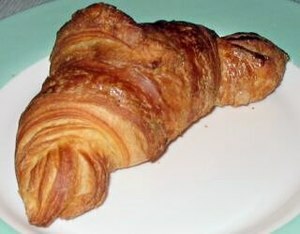 Just a plain croissant: no chocolate, no apricots, no sugared almond paste. A plain croissant, beautifully risen golden, flakey pastry glowingly shining goodmorning to me. So when I order one and you take your tongs to it because of hygiene reasons – fine: BUT DON’T CRUSH IT, YOU PHILISTINE! Right. I think that was it. Rant over. Step away from Soapbox. Please feel free to go on with your day. Awesome blog! Do you have any helpful hints for aspiring writers? I’m planning to start my own website soon but I’m a little lost on everything. Would you propose starting with a free platform like WordPress or go for a paid option? There are so many options out there that I’m totally confused .. Any suggestions? Many thanks! Hey, well it depends I guess what you want to do with it. If you just want to see if you like it, start with a free one and then upgrade. Free ones are good enough in that they give you templates and enough help to get started easily. Good luck!